Earlier this month we ran the first ever Leeds Digital Fashion Week and one of the big supporters of the project was the Victoria Quarter. During LDFW I met up for a coffee with the Centre Director John Bade to talk about the history of the development and how it has changed over the past 22 years. Lee Hicken: How long have you worked at the Victoria Quarter? John Bade: I have been here 22 years. LH: And what has been the evolution of the VQ over those years? JB: I think that is the right word ‘evolution’ because in 1990 we opened with 3 stores at the bottom end of a major retail recession and by the Christmas we had about 18 tenants. It took us about 5 years before we were fully let, we brought some great independent retailers back to the city centre. Then 16 years ago Harvey Nichols came along and that had a knock-on effect bringing retailers who wanted to be near Harvey Nichols, people like Gieves and Hawkes, Jo Malone and Kurt Geiger. Then around 10 years ago, Louis Vuitton came here which had the knock-on effect for County Arcade with Mulberry and Church’s Shoes. Over the years we have had three different owners; The Prudential developed it, then Highstone Estates bought it, then sold it to the Bank of Ireland and now we are going through the process of being sold to Hammerson and each owner evolves the centre as well as adds their little piece to it. When Hammerson take over that will be the next stage to our growth and I think that is part of our strength; we have grown slowly in stages. LH: How much do you think the architecture of the space has an effect on the brand overall? JB: Because I walk around here every day you can sometimes take it for granted. One of the great things is when we get visitors here for the first time as they are usually in awe of the building. 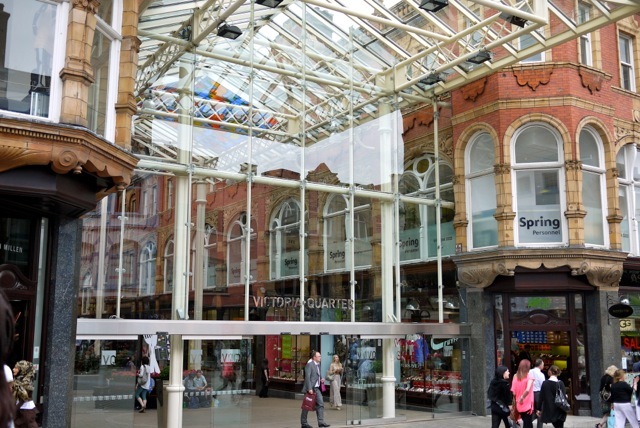 LH: What happened when Harvey Nichols opened in Leeds, did it change the retail scene here? JB: I think before Harvey Nichols came there were more smaller individual brands and when HN arrived we did start to attract more London labels that we would of struggled to get. In the early days we were trying to get labels that were only available in London and that was difficult. In the early days we courted Jigsaw and once we had them we got Karen Millen and Hobbs. People began saying “Why have they gone to Leeds?” or “What is it about Leeds?” which was great. LH: What is the future for the VQ? What do you think the next level is? JB: The beauty of the VQ is that it is always evolving. We have to always make sure our tenant mix is right, making sure our overall experience is what people want. I think our tenant mix is one of the best in the country and we have to keep it that way. LH: With Eastgate, Trinity Leeds and the Leeds Arena on the way, do you think we could get back some of that buzz we had when Harvey Nichols came in the 90s? JB: If we go back a few years, people would go for a day out in Leeds (city centre) and think of the places they could shop, like here [VQ], Bond Street Centre etc but I think now people say: “Shall we go to Meadowhall or Trafford Centre?” I think Leeds, rather then fighting between itself internally, should work together to say “we are a better day out and a better visitor attraction in terms of shopping.’ Because that is what people want, they want a day out, because it is not “I’m going to buy a shirt and go home”, people want a nice coffee, nice shopping, nice bit of lunch so we are in competition with other cities rather than ourselves. LH: What do you think Leeds needs to do to become more relevant in the fashion industry on a global level? JB: It is important to sell ourselves better. Leeds has always hidden its light under a bushel. Also finding the right home for independents is important. It would be great if we had an area for independents although independents seem to cluster together and create their own spaces so that will happen naturally I think.